Holiday Gift Guide: Cut The Stink with Wahl Pet Products. I absolutely HATE pet stink! Living in Vermont I can’t really give Loki baths this time of year and I have been unable to find a local groomer yet. 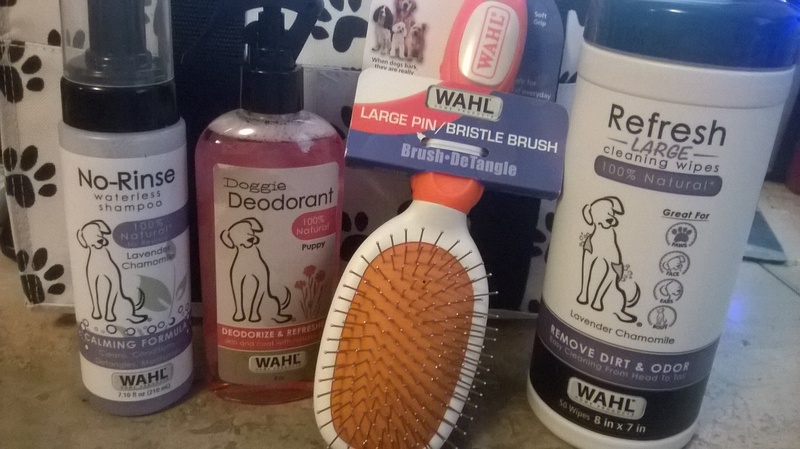 Wahl has some GREAT products to combat dog stink and they recently sent me some of their products to try. Wahl has a huge line of pet grooming products, these products include shampoos, odor neutralizer, wipes and more. They recently sent me their No-Rinse Waterless Shampoo, Odor Neutralizer and Doggie deodorant and a brush to help keep Loki fresh smelling between baths. The No Rinse Waterless Shampoo is 100% natural and leaves no residue. I received it in Lavender Chamomile and is a calming formula that cleans, conditions, detangles and moisturizes. This product can be used on both cats AND dogs. The Doggie Deodorant is also 100% natural and deodorizes and refreshes the skin and coat with natural oils. It contains Corn Flower and Aloe Extracts that helps ensure natural oils and moisture stays in the coat. This product states on the bottle that it can be used on both dogs and cats. The brush I received is the Large Pin Brush and is designed to detangle and smooth the coat and move the oils from the skin and down the hair shaft. It is perfect for all coat types. The Refresh Large Cleansing Wipes are also 100% natural and are great for cleansing paws, face, ears and body. They are designed to remove dirt and order and provide easy cleaning from head to tail. These wipes are fantastic and require no rinse. The bottle also states it can be used on dogs and cats. The MSRP of these products are $5.99-$8.99. I absolutely LOVE the goodies that Wahl sent me. They make keeping my pets clean so easy and convenient on both my pets and I. These are products that any pet parent would LOVE to have and I am very impressed with these items! I absolutely LOVE how they smell and how they make my pets smell! See their whole line of pet products on their website.